At the forum "Young and Committed", Commissioner Iván Velásquez called upon the youth to join forces in fighting impunity. Guatemala, July 30, 2013. The trial of seven individuals accused in the Pavón, Zacapa and La Cueva cases of being involved in the extra-judicial killing of ten inmates is expected to conclude tomorrow. At the trial, the Public Prosecutor’s Office (MP) and the International Commission against Impunity in Guatemala (CICIG) filed 152 pieces of evidence to Court B of the First Criminal Instance for High-Risk Matters. Among the evidence were statements of witnesses, expert opinions, audiovisual evidence and material evidence—all of which demonstrates how the extra-judicial killings were committed. At the trial, 34 witnesses gave statements: five of whom were inmates and the rest were either police officers or other individuals. The witnesses recounted the manner in which the accused individuals apprehended and extra-judicially killed the inmates. The documentary evidence included post-mortem examinations, expert opinions, ballistics reports and the Pavo Real and Gavilán operation plans (designed to track and murder the inmates). As to the audiovisual evidence, videos and photographs support the authenticity of the testimony. In addition, material evidence was offered, such as the arsenal of weapons (reserved for the exclusive use of the Army) located at the residence of Aldo Stefano Díaz Figueroa (accused individual). Víctor Hugo Soto Diéguez: 300 years in prison on the charge of extra-judicial killing, under the Pavón, Zacapa and La Cueva cases. Víctor Manuel Ramos Molina: 90 years in prison on the charge of extra-judicial killing, under the Zacapa and La Cueva cases. Axel Arnoldo Martínez Arreaza: 90 years in prison on the charge of extra-judicial killing, under the Zacapa and La Cueva cases. Aldo Stefano Figueroa Díaz: 270 years in prison on charges of murder, criminal association, illegal possession of firearms and illegal possession of ammunition, under the Pavón case. Francisco González Ibáñez: 27 years in prison on the charge of extra-judicial killing, under the Zacapa case. Edwin Emmanuel Rivera Gálvez: 54 years in prison on the charge of extra-judicial killing, under the La Cueva case. Nicolás Camajá Bach: 27 years in prison on the charge of extra-judicial killing, under the Zacapa case. María del Rosario Melgar Martínez: 27 years in prison on the charge of extra-judicial killing, under the Zacapa case. The investigations established that a parallel structure was created within the State and it had the power to extra-judicially kill individuals deemed to be the "dregs" or "enemies of society". The group used State power and machinery to conduct its criminal activity as well as creating impunity for actions which it knew were illegal. Julián Morales Blanco, 01/12/2005 (La Cueva, Los Amates river, Santa Rosa). José María Maldonado Sosa, 01/12/2005 (La Cueva, Los Amates river, Santa Rosa). Luis Alfonso Zepeda González, 25/09/2006 (Pavón prison, Fraijanes, Guatemala). Jorge Eduardo Batres Pinto, 25/09/2006 (Pavón prison, Fraijanes, Guatemala). Mario Misael Castillo, 25/09/2006 (Pavón prison, Fraijanes, Guatemala). Carlos René Barrientos Vásquez, 25/09/2006 (Pavón prison, Fraijanes, Guatemala). Gustavo Adolfo Correa Sánchez, 25/09/2006 (Pavón prison, Fraijanes, Guatemala). Erick Estuardo Mayorga Guerra, 25/09/2006 (Pavón prison, Fraijanes, Guatemala). José Abraham Tiniguar Guevara, 25/09/2006 (Pavón prison, Fraijanes, Guatemala). At the trial images were shown of the authorities entering Pavón prison to conduct the operation. The images depict the transfer of inmates to the patio, where they are stripped bare and some are selected. Then, the selected inmates can be seen dead in prison property wearing different clothing. Evidence also demonstrates how the authorities simulated an armed confrontation between police officers and inmates, who allegedly tried to prevent the prison from being searched. Pavón Case: The parallel structure used the Pavo Real Plan to enable its members to enter Pavón prison. The members then extra-judicially killed the aforementioned seven inmates. La Cueva Case: The fugitives Julián Morales Blanco and José Maldonado Sosa were apprehended alive by National Civil Police (PNC) officers and, under police custody, were extra-judicially killed by the parallel structure. Zacapa Case: The fugitive Edwin Estuardo Santacruz Rodríguez was apprehended alive by members of Group 3 of the Gavilán Plan and, under police custody, was extra-judicially killed by the parallel structure. The creation and existence of a parallel structure within the State which extra‑judicially killed ten individuals in 2005 and 2006. The identification of the backbone of the parallel structure and some of its members. The same modus operandi was demonstrated across its actions. And, hence, ten extra-judicial killings can be identified. CICIG acts as a complementary prosecutor in these criminal proceedings. The Republic of Guatemala, a mountainous country that lies in the Central American isthmus, has an estimated population of 13 million people. Guatemala won its independence in 1821, following almost three centuries of Spanish colonial rule. 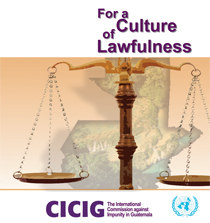 2019 The International Commission against Impunity in Guatemala. The content of this webpage can be reproduced if the source is acknowledged.